American Ballet Theatre’s brief Fall 2018 Season began last Wednesday, and continues through October 28. During the 13 performance run (plus a Family Matinee), the company is scheduled to present revolving repertory programs featuring two premieres – one choreographed by Michelle Dorrance and one by Jessica Lang, a brief two performance (one at the Family Matinee) redux of Le Jeune, Lauren Lovette’s piece for ABT’s Studio Company and apprentices, the return of Twyla Tharp’s landmark In the Upper Room, George Balanchine’s Symphonie Concertante, Wayne McGregor’s Afterite, Alexei Ratmansky’s Songs of Bukovina, and Jerome Robbins’s Other Dances and Fancy Free. The two programs I saw last week were a mixed bag, but they introduced Dorrance’s first dance created for ABT, Dream Within a Dream (deferred). My initial take on Dorrance’s dance was not favorable, but on second view, became less negative. Perhaps on a third view I’ll come around completely. And it’s certainly possible that my initial reaction to the dance was impacted by my distance (physical) from the theater stage, and by it being not at all what I (and the audience gathered for ABT’s Fall Gala) expected. Dorrance didn’t get to be the reigning Queen of Tap for nothing. I’ve seen several of her company’s performances in recent years, and while, to my taste, there may have been too much experimentation with expanding tap in new directions which compromised the piece’s overall impact, when you’re a “MacArthur Genius” you’re entitled, even expected, to experiment, take risks, and make unusual things happen. 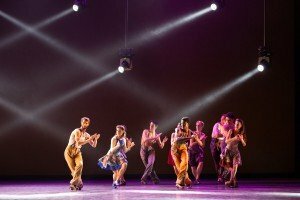 And at bottom, it’s the tap prowess of Dorrance and her company dancers, rather than electronic experimentation or emphasis on other dance forms that may have sprung from the same tree, that is most memorable. When Dorrance’s new piece was announced, I assumed it would be tap seen through a balletic prism, or vice versa. But Dream Within a Dream (deferred) isn’t that – at least that’s not the overt focus (it’s done more subtly). Rather, the dance is a study in getting ballet dancers to move to songs by Duke Ellington; the tap component, subject to a theory I elaborate upon below, seems almost an afterthought. Lively and/or jazzy dances to Ellington’s music have been done many times before. [ABT’s70s staple The River, choreographed by Alvin Ailey, seemed to appear on every program (some things never change), and Susan Stroman’s Broadway-ish For the Love of Duke for New York City Ballet (which included Blossom Got Kissed and Frankie and Johnny … and Rose) come immediately to mind.] Dorrance’s piece isn’t those either. And it resembles dances she’s created for her own company (that I’ve seen) only remotely, when the pace of those dances slows. And that’s a large part of the problem that I have with Dream Within a Dream (deferred). Dorrance’s curated score includes eight of Ellington’s bluesy/jazzy songs, which results in bluesy/jazzy movement. The result, at least toward the piece’s beginning (to Such Sweet Thunder, Echoes of Harlem, and Across the Track Blues), comes across as moving in seeming slow-motion down to the pace of the music. It’s not really that syrupy, but from my vantage point it seemed that way. And there’s no apparent superimposed thematic element – even a common general “attitude,” like kids in a schoolyard having a good time – that might make the piece more entertaining. It picks up speed eventually, but by then much of the damage has been done. More significant a problem, however, is the integration, or lack of it, of these ballet dancers with tap. There’s little of it until the dance approaches its end, and what there is, particularly at Wednesday’s world premiere, was danced tentatively, as if the dancers were only dipping their toes into the tap river to see what it felt like. Indeed, until more tap appeared toward the dance’s conclusion, there was clapping of hands where one might have expected the tap dancing to be, as if these ballet dancers weren’t really capable of tap so Dorrance substituted handclaps. Similarly, the movement quality, designed to visualize Ellington’s music, looked uncomfortable to many (though not all) in the opening night cast, like clothing that didn’t fit. As I watched, particularly on second exposure the following night, I saw an overall picture that was vaguely remindful of Jerome Robbins’s Moves and his New York Export: Opus Jazz, but with very little of those dances’ spirit and contagious, youthful effervescence. Dream Within a Dream (deferred) at times seemed to want to replicate that effervescence, but the music wouldn’t let it. Dorrance may have intended the piece to reflect the inner souls, as well as the adaptability, of ballet dancers, or dances at a different kind of neighborhood gathering (to reference another Robbins masterpiece), but it just looked strained. Like most of Dorrance’s company’s dances that I’ve seen – it also doesn’t have much glue to hold it all together (although with her company performances, extraordinary tap facility is all that’s really necessary). It seems a collection of interconnected scenes featuring one dancer or group or another taking turns being the focal point. If there’s a link between these vignettes (other than visual continuity), it may relate to the ballerinas (as I recall, all five of them) wearing toe shoes toward the beginning, and at times trying to tap with them, but toward the end switching to tap shoes. [I don’t recall if the five men underwent similar transitions.] In light of that, and given the dance’s evolution, I have a theory (and one that also helps explain the dance’s title). I think, in a sense, Dorrance is attempting to tell a story of a young person (particularly a young would-be ballerina) who feels bound to a particular style of dance (like ballet) because that’s what little girls did, or maybe that’s what her parents wanted her to try, but really wanting to know what it feels like to let loose and tap – as if dreaming about what he/she really wants to do while constrained (dream within a dream), but having to defer acting on that impulse. So I checked – and sure enough, according to Wikipedia, when Dorrance was growing up in North Carolina, she took ballet classes at her mother’s ballet studio before pursuing her true interest. [Her mother had been a member of Eliot Feld’s American Ballet Company (later simply Feld Ballet), one of my favorite companies when I first started attending dance performances.]. So maybe there’s some of her history in this piece – although she apparently matriculated to tap very early on. Be that as it may, the second cast, overall, created a much better impression than the opening night cast (although, again, my position in the theater might have had an impact on that). While I appreciated in particular the work of Calvin Royal III and Breanne Granlund, and the obvious effort from Sarah Lane to learn a new movement language, and it was sort of fun to see them try to let loose, others looked relatively lost. They all – at least the ballerinas – seemed far more at home in toe shoes. But the second cast appeared to “get it” more instinctively – as if it was movement they grew up with (or had more rehearsal time to grow accustomed to). Zimmi Coker, Duncan Lyle, and Jose Sebastian were particularly outstanding, and Casandra Trenary and Stella Abrera handled the different movement very well also. But for me the biggest surprise was Devon Teuscher. I’ve commented previously that notwithstanding her sterling technique, I never get a sense of a personality, a stage persona, from her performances. But she exploded with personality (combined with that sterling technique) in this piece. The remainder of the opening night cast included Gillian Murphy, Christine Shevchenko, Patrick Frenette, Arron Scott, Roman Zhurbin, and James Whiteside; the second cast was completed by Betsy McBride, Erica Lall, Granlund, Connor Holloway, Tyler Maloney, and Marshall Whiteley. I finally caught up with Le Jeune, the piece that New York City Ballet Principal Dancer Lauren Lovette created for ABT’s Studio Company and Apprentices. This is a movement piece, with no ulterior choreographic motive (unlike the ballets she’s created for NYCB) than to show an audience what these ten young dancers can do in an interesting way. That it did. To Eric Whitacre’s Equus (as if the relationship of ballet dancers to thoroughbreds wasn’t already sufficiently apparent), these dancers never stop moving for too long, and the result is an invigorating stew of young talent, with plenty of choreographic variety and deft use of stage space. Including the solo piece she created for her NYCB colleague Ashley Bouder last year, there seems nothing that Lovette cannot do, and do well. Thursday’s program opened with Balanchine’s Symphonie Concertante. Created for students of the School of American Ballet in 1945, in its complete form it premiered with New York City Ballet’s precursor company, Ballet Society, in 1947. It’s dominated by ballerinas – a supporting group of six featured dancers and sixteen members of the corps, all led by two ballerinas, with one lone danseur. Many consider it another Balanchine masterpiece, but to me it’s not nearly as exciting to watch as other Balanchine classics. While it’s certainly a brilliantly crafted piece and one in which his genius for making music come alive is apparent, to my eye it’s too balanced; too classical, and with exceptions, almost too stiff. I can admire it greatly, but again with few exceptions, it didn’t move me in any particular direction. Of course, it would be perfectly appropriate to create a more “classical”–looking ballet when the composer is Mozart. To Sinfonia Concertante in E Flat major for Violin and Viola, Balanchine follows Mozart’s lead, not so much bound to it (at least following the clunky-looking beginning) as directed and inspired by it. The parts of it that I found best were those in which the lead ballerinas were moving to and echoing the texture of the two prominent instruments: a violin and viola. Having dancers move in perfect response to instrumental point and counter point is one of Balanchine’s signatures, and here it’s done very well, but overall the piece in other respects comes across as glorious but academic. Fortunately, the two leading roles were danced exquisitely by Shevchenko and Isabella Boylston. Both these ballerinas dance “big,” and appearing commanding helped make this performance successful. Shevchenko, recruited on short notice to replace the injured Hee Seo, was utterly fabulous, managing to pull off Balanchine’s wickedly difficult precision footwork and musical timing without looking strained. I often have difficulty with Boylston in classical roles, but aside from appearing a bit pained, she matched Shevchenko in quality if not in spirit. Blaine Hoven did excellent work completing the lead cast. What I find most interesting about Symphonie Concertante, however, is its connection with other Balanchine pieces created during roughly the same time period. I expect to see another performance later in the run, and will elaborate on that theme (and variations) then. The two final pieces on these programs sent audiences home happy. Twyla Tharp’s In The Upper Room is a contemporary masterpiece that never stops looking as inventive and exhilarating as it is. And Skylar Brandt would be reason enough to see it even if the piece weren’t already. Soon after she became a member of the company, Brandt danced one of the two “red toe-shoe girls” (together with Nicole Graniero), and their energy and precision execution was stunning. Now a soloist, she’s graduated to being one of the “pajama” leads, and although this role is not quite as thrilling to watch, it’s more demanding, and she delivered a sterling performance. Her mirror, Teuscher, wasn’t quite as energized here. And Boylston, the third “lead,” executed well, but lacked the spark that makes the determination inherent in Tharp’s choreography enjoyable. Thursday’s closing piece, Fancy Free, should be dated by now. 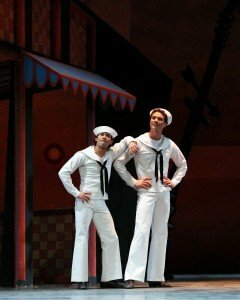 That it isn’t is a tribute to Robbins and the ABT dancers. The plot is probably one of the most familiar in modern ballet (and that the visualization of the story hasn’t succumbed to politically correct revision is something to be thankful for), and is unnecessary to repeat. Suffice it to say that, with Leonard Bernstein’s score, it’s fun from beginning to end, and ABT’s dancers did it justice. None are strangers to their roles. Herman Cornejo, Cory Stearns, and Whiteside were the sailors (in order of featured solo), and Abrera and Murphy (with Lauren Post as the climactic siren) the women they try to impress. The three sailors did fine work, as usual, but Abrera and Murphy danced and acted spectacularly. On to the season’s second week in a subsequent review.